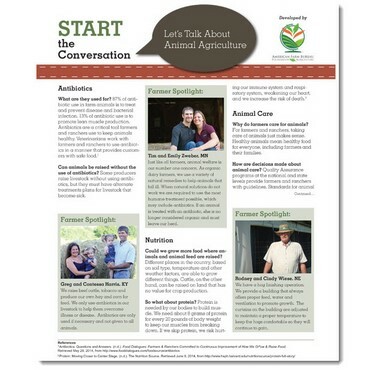 This two-page handout was created to help connect consumers with the men and women who produce their food, fiber, and fuel. This resource can be used in middle and high school classrooms, fairs and festivals, and on the farm to facilitate discussion about fact, fiction, and the science of agriculture. You may return all items purchased at the Farm Bureau Store within 30 days of the original product delivery date. We will pay the return shipping costs if the product is defective or being returned because of our error. If the item is returned for any other reason, you are responsible for the return shipping cost and a $5 restocking fee. Items should be returned in their original product packaging. We will credit you in the same manner as your original payment within 7-10 business days of receiving the returned items. If you need to make a return, please email orders@fb.org for shipping information.